13 Action News has a positive update to a horrible story you first saw earlier this month. 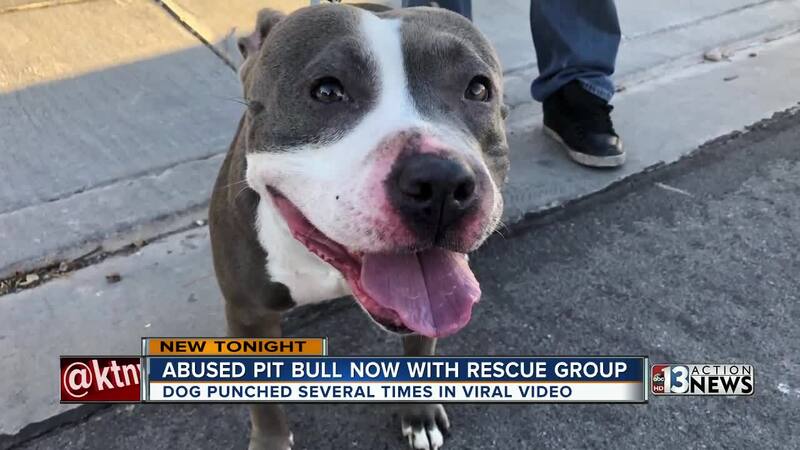 A pit bull seen in a viral video being punched over and over is now with a rescue group. "I got about halfway through the first part of it and turned it off," said Ralph Mansch with Big Paw Rescue. "I just couldn't believe what I was seeing." The story was gone viral over the past few weeks. The man in the video can be heard making threats to a someone while beating up the dog. Authorities believe it happened right here in Las Vegas. "How could this guy dare to do this to an animal ?" asked Mansch. The man seen beating the dog in the video is not the dog's original owner. The original owner tells Mansch that man was his roommate. "He couldn't believe it," said Mansch. "He called the guy and was like hey you are no longer a roommate here. You are not allowed here." The original owner still decided to surrender the dog to Big Paw Rescue with the hopes she will have an even better life. "She's the greatest dog," said Mansch. "Like I've never seen a dog that's when through this, act like nothing happened." Originally named Athena, now named Kellina, the four-year-old pit bull is resting comfortably now. "She's all over me. She wants to play. She wants to kiss. She wants to run around." Kellina will see a vet Thursday morning for the first time since the attack. And then she will be almost ready to find a forever home . "I'll probably work with her for a little while with some training issues, and then she will be ready to be adopted out." Local police and the local D.A. 's office tell 13 Action News this case is now in the hands of the FBI. At last check, the man in the video has not been arrested.